Everyone sings the praises of talking therapy these days. A myriad of therapies, each with their own logic and rationale and a technical sounding acronym, claim to cure an increasingly diverse range of problems including depression, obesity, poor parenting and cancer. Whether its CBT (cognitive behavioural therapy), or DBT (dialectic behavioural therapy) or plain counselling, or one of the newer forms of therapy like ACT (acceptance and commitment therapy), there’s a group of experts somewhere claiming that this particular therapy is going to make you happier, healthier and better adjusted. The UK government is so confident of the benefits of therapy, it is convinced that therapy is the solution to getting depressed people back to work. The Increasing Access to Psychological Therapies initiative (with the less than memorable acronym, IAPT), was set up with government funding and backing with the express aim of cutting the spiralling sickness benefits bill. Surely all this therapy is a good thing? Surely there’s nothing the matter with talking to a nice middle class professional who is paid to listen attentively and focus on you and your worries? Paul Moloney’s well-argued, readable and passionate book suggests that there might be, and he makes a compelling case. Moloney analyses therapy from three angles: the political, the philosophical and the empirical. On each count therapy is found wanting. From the political point of view, the over-riding problem with therapy is that it locates the problem within the individual, and optimistically leads people to believe that if only they can adjust their thinking, their problems will be solved. But there is extensive literature that demonstrates that being diagnosed with a mental disorder is strongly associated with living in conditions of social deprivation, poverty, or coming from a lower social class. Unemployment, insecure employment, poor housing, being a victim of crime, family breakdown, childhood abuse- all these factors make the incidence of mental disorder substantially more likely. Not only does therapy have no chance of addressing any of these, it allows society to look the other way, and present mental disorder as an individual weakness or vulnerability, rather than a more or less predictable result of living a marginalised existence in a society that increasingly celebrates extreme wealth and conspicuous consumption. From the philosophical point of view Moloney argues that therapy is based on a misguided Cartesian separation between mind and person. There is no mental ‘CEO’ guiding and directing our actions, which can be coached into being more effective. He surveys research that demonstrates that we are not reliable reporters of our inner experience, and suggests the autonomous self of psychotherapy is an illusion. The self cannot be separated from its actions, which are responses to all its circumstances, past and present. Moloney provides a detailed critique of the research on the effectiveness of psychotherapy, pointing out its major weaknesses, such as the difficulty of designing a ‘placebo’ or inactive therapy, and controlling for influences like the expectations of the therapist. The results are in any case disappointing, showing only small effects (like antidepressants). 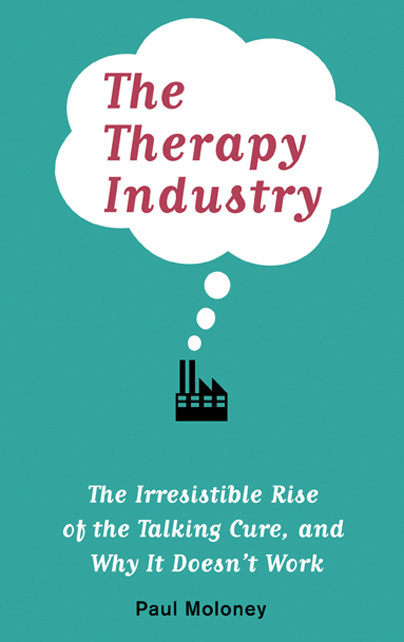 Moreover, all types of therapy appear to have about the same effects, and attempts to show that the specific ingredients of a particular therapy make a difference, such as the cognitive aspects of CBT, have failed (similarly, the effects of antidepressants are small, of doubtful clinical significance and despite being chemically diverse, there is no meaningful difference between agents). Moloney reserves his harshest criticism, rightly, for the evaluation of the IAPT programme. This massive and expensive government-funded programme did not even bother to enlist a comparison group. The results of the evaluation are consequently completely worthless, even by the fairly uncritical standards of psychotherapy research itself. Moloney is not arguing for other types of interventions for mental health problems. He is just as critical of the mass prescription of psychotropic drugs like antidepressants and the whole project of constructing behavioural and emotional problems as medical diagnoses. And I don’t think he is suggesting that mental health professionals should turn people away, or refuse to help the cases of individual misery they are confronted with daily. But he is reminding us that therapy, like drug treatment, encourages the idea that the individual is inadequate and in need of fixing, with expert therapeutic or pharmacological help. In this sense therapy provides a useful diversion from the social causes of discontent and undermines the impulse to agitate for a fairer and more equitable society, in which everyone can lead less blighted and more meaningful lives. A square peg in a round hole: the construction of depression as a disease. Joanna: In addition to seeing psychiatrist for “manic depression,” that morphed into “bipolar,” I also have seen three talking therapists-all women. I am not certain of the long-term benefits of these sessions, but it got me out of the house, and they were sympathetic listeners. Having been involuntarily committed and having the albatross of a “history of mental illness” hung around my neck, I felt like I was being validated by a person who was an expert, some one in authority-The therapist. I also noticed that the last two therapists seemed to buy into psychiatric drugs, but this was not a huge issue. Also, I made it half-way through the counseling program at Marshall’s Graduate College in South Charleston, WVa. The instructor I had for the Introduction toMental Health was adamantly opposed to my critical postings about psychiatry, especially as I critiqued the role of psychiatry in the mental health field. I feel that I was practically driven out of the program. The instructor and her acolytes took great pride in proclaiming the great strides in psychiatry, mental health, and anti-stigmatization, but I am left feeling very stigmatized from the experience myself. PS. I hope to see your future postings on MIA. I’m a registered counsellor so I am biased! However, I consider myself politically aware, left leaning and very conscious of the impact that politics have on individual mental health. My work is currently with women living with past or current trauma. I don’t have the ability to change their history or current circumstances but I hope to assist in the building of capacity to manage their lives. I have seen many clients leave a mental health diagnosis in the past and others move from inertia to connection with the world in new ways. Research in the area is inherently challenging. I remain politically active in my own realm and attempt to alleviate some of the distress in the realms of my clients. I agree with you that some people can benefit from therapy, and my review was not meant to suggest otherwise. I think it is consistent that therapy can help some individuals to cope with their suffering, but of course the more effectively people learn to cope, the more society can cast a blind eye to the conditions that make life difficult in the first place. I am a psychiatrist, and I think that psychiatry has much the same role: to provide support for people who have had very difficult lives, and find the many demands of modern life impossible to manage. Although I think that creating a fairer society, with easier access to productive, rewarding and non-exploitative employment, will go a long way to ameliorating mental health problems, that does not mean that we should not help people here and now who are the casualties of our current system. We’ll have to go back to psychoanalysis. Seriously. Behavioral and Cognitive therapies are not effective because they do not address unconscious conflicts. That’s why one reads that ‘there is no mental ‘CEO’ guiding and directing our actions, which can be coached into being more effective’ and ‘that we are not reliable reporters of our inner experience’, as well as ‘the self cannot be separated from its actions, which are responses to all its circumstances, past and present.’ When reading this, one can only be reminded of the unconscious, and how it tricks our conscious mind, namely the ‘CEO’, the ego, or whatever one wants to call it. I found something wonderful. Bioenergetics. Which was developed by Alexander Lowen, a disciple of Wilhelm Reich, who in turn was a disciple of Freud. Imagine being able to measure and individual level of psychopathology, through muscle tensions. It’s true. It is measurable, and it can be addressed through specific exercises. It bothers me how psychoanalysis is no longer mentioned nor respected. Yesterday a read a brilliant article by a Dr. Kaiser which I found in the Psychiatric Times via PsycheTruth, a youtube channel (here it is: http://www.psychiatrictimes.com/articles/commentary-against-biologic-psychiatry). It’s just terrifically well written and so brilliantly insightful. Let’s go back to Freud, a little bit. C’mon. I know people hate him, but that’s just because they don’t understand his work. Let’s grow a brain. Do it for the patients. Thank you. Joanna, I bought your book in Spanish, ‘Hablando claro’. I am Catalan. Thank you. And thank Dr. Healy too, if you see him. And Peter Breggin. All of them, on my behalf. Thank you.